This is a high power 14500 cell. 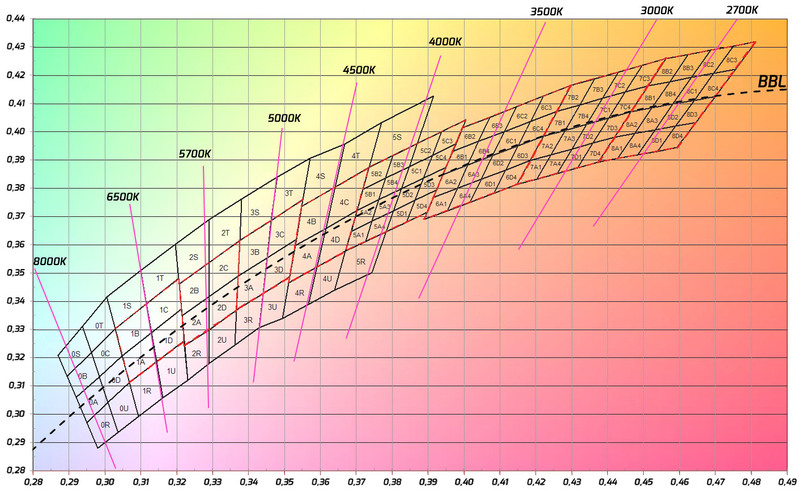 The curves tracks fairly well, but there is a small capacity difference between the two cells. They are very impressive in their handling of high currents, capacity is nearly the same, even at 7A and the voltage is fairly high. These cells are fairly low in capacity, but better than specified. Their high current handling is very good. I will give them an acceptable rating. The name is… insane. I won’t wanna show that battery to friends, else wont hear the end of it. Any source right now that doesn’t sell in bulk? All I see currently is 50pcs minimum. Lets do a group buy. Where are the 50 available. on his site, the best site on planet Earth for batteries. If can maintain those discharges rate for few cycles, that’s good. I think better than many others IMR 14500, that usually stated higher capacity, but end up have lower capacity for higher discharge rate than this one. Hhmm. This looks like the best 14500 cell HKJ tested, as far as having the lowest internal resistance. 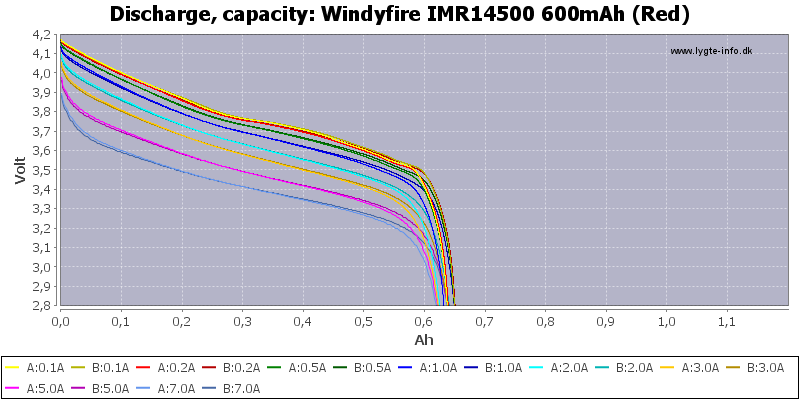 Plus it has higher capacity than 750 labeled IMR cells. We gotta get some of these - somehow. 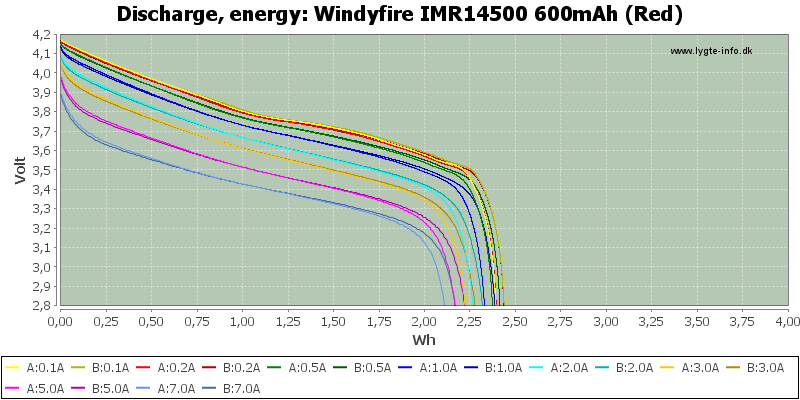 The Sibiele or AW IMR is the closest, closely resembling it's discharge curve at 2A for example, but the WindyFire hold a higher voltage and for higher capacity. 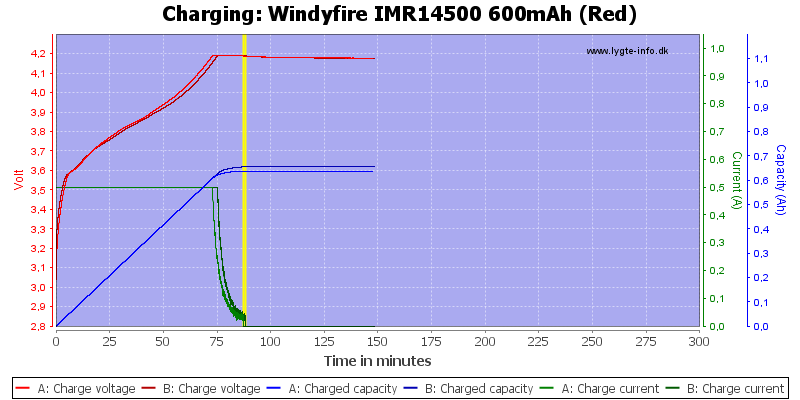 It clearly beats the Kinoko IMR 750 mAh. I'm thinking we'll see these cells under different labels, maybe soon. It's good to see a *fire brand that has good batteries. Thanks for the test! 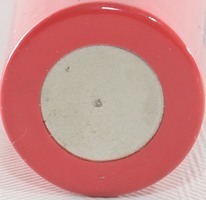 our company are specilizing in battery especially high drain battery for cigarette, if you want to buy Windyfire battery, you can login in our website www.windyfire.com and make the order, some customer had try buy this way, hope you have a pleasure shopping, also any questions, you can leave message to me, thanks. linda - how does the cost of shipping work? The site says it will email the cost? Yikes - this is terribly unfriendly. I would only be interested in the cheapest method. Your listed prices are very good on just about everything, so have a feeling shipping is extremely high . Hello, Friend, this is Linda from Shenzhen Windyfire Technology Co.,Ltd, glad to meet you here, and gald to know you are interested in our battery, we have a company website www.windyfire.com, and you can register on it and make order from our company, or if any questions, please do not hesitate to sent email to me, my email is linda@windyfire.com.thanks very much. Dear Friend,this is Linda from Shenzhen Windyfire Technology Co.,Ltd, gald to know you are interested in our battery, our company have a company website www.windyfire.com, you can register on it and see what you are interested in, any questions, you can sent email to me, my email address is linda@windyfire.com. When I read the Fire in the name, I almost didn’t even read the review. lol But looks fairly promising. Thanks for taking the time to review them. Linda - thanks for responding. I did register and did attempt to order batteries and have not gotten an email reply yet about shipping costs. I'll email you. 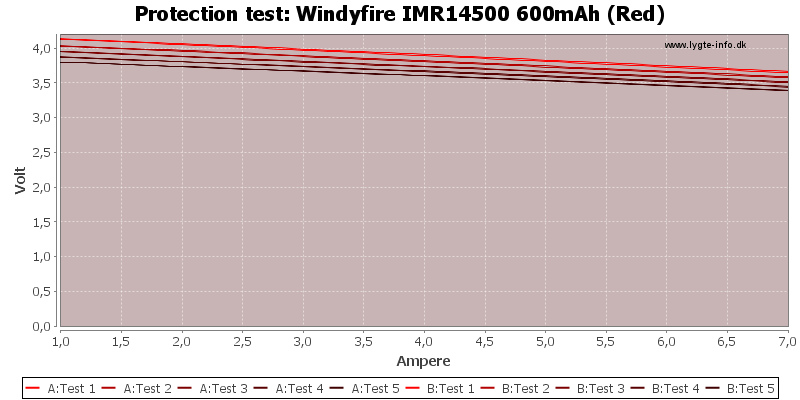 Dear Friend, this is Linda from Shenzhen Windyfire Technology Co.,Ltd, thanks for your comments of our battery, you can visite our website www.windyfire.com and register on it ,and make order from the website , any questions, please contact me by email, my email address is linda@windyfire.com.thanks very much. Hello, Tom, this is Linda from Shenzhen Windyfire ,thanks for your register on our website www.windyfire.com, thanks for your good questions, and i reply all you questions by email linda@windyfire.com, please check it, any questions, please feel free to contact me, thanks very much.Tom. The battery performance certainly looks very good, but we can already see some potential issues with customer service judging by the amount and spammyness of the rep’s replies. Hello,Tom, i had sent email to you about your order, please check your email, any questions, please feel free to contact me. Dear friend, we understand your anxious for the customer service, for every questions from our customer, we should responsible and help them deal with it patience, for many customer, maybe have the same questions,like shipping cost, like delivey time,this is they are most concern, our company will give suggestions to them one by one based on their requirements. if you have any questions or need more information from us, please contact my email linda@windyfire.com, thanks very much. Linda, I’m sure people can read your first post just fine. No need to copy and paste them again and again. Tom E, appreciate if you can share your order details – price, qty, shipping etc? Just want to chime in and share my experience about this vendor. 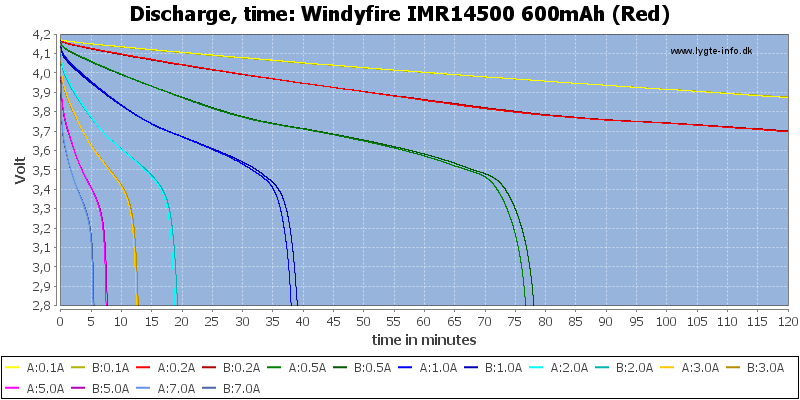 Anyone who has trouble ordering 14500 outside US (like myself) can use windyfire’s website to get some batteries. I wanted some high drain ones for my BLF X5 so checked the website and asked for a shipping quote from customer service. In a day I received and accepted an offer with tracking nr. Now I have the batteries on hand, packaging was prepared with care, cells are performing fine. Linda from CS was helpful all the way so I am a happy camper. Also looking for some decent 14500’s for my BLF X5. Bought some “brand” batteries, but was not pleased with their performance. Even bought some “authentic xxxxx-fires”. 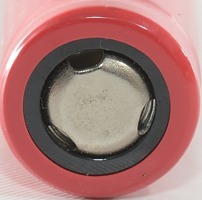 These outperform the batteries supplied with top-of-the-bill AAA-lights, but collapsed under the pressure of the X5. I have read the review of HKJ, but shipping cost can be a dealbreaker. Can you share what offer you got form Windyfire (or PM me)? For 4 of these batteries I paid about 12 USD including about 5 USD shipping to Hungary. I think this was fair after all, they perform fine. Thank you, I just ordered 4 batteries and they will send me an email with the total cost (including shipping). Edit1: Got an answer within 2 hours. Total cost $12.80 for 4 batteries in a case plus shipping. So it’s a deal. Thank you for pointing me into the right direction. Edit2: Arrived yesterday, 17 days after ordering. Four batteries and a complementary case. All individually packed. Wrapped in bubble plastic with foam padding between the batteries. Delivered in a bubble-lined envelope that fits the dimensions for letter-mail. Thank you, WindyFire! Linda from Windyfire asked me if I would share my experience – why not? I asked for a price for four 800mAh 14500’s (purple) and got a price but a few days later Linda said they could only supply the red ones that are reviewed in this topic as they only had one purple left. She gave me a price of $7.60 + $5.60 shipping ($13.20 total) for the four red plus the single purple as a gift. This seemed fine to me. They were dispatched. I received them in a decent timescale. They were very well packaged in a battery case. I have used a couple of the red and also the purple. They seem to be fine. In all, I’m very happy with my transaction – it is a little bit different from some of the normal suppliers who quote a shipping free price but hey-ho, it doesn’t really matter in the grander scheme of things. Linda replied to my emails quickly enough and I’m happy with her communications. I’d have no issues buying from Windyfire in the future. Thanks for mentioning this, I had completely forgot it was possible to order directly from them. Thanks for the review, I’ve been looking at these. I don’t have a problem buying “fire” brand 14500’s if they test well. All my 18650’s are “name brand” pano, lg,samsung etc. I have Nitecore, olights, efest, awt 14500’s, so in my mind all 14500’s, 18350’s, 26650’s etc have the potential to be a“fire” brand from the factory. I really don’t know who makes these non 18650 batteries. 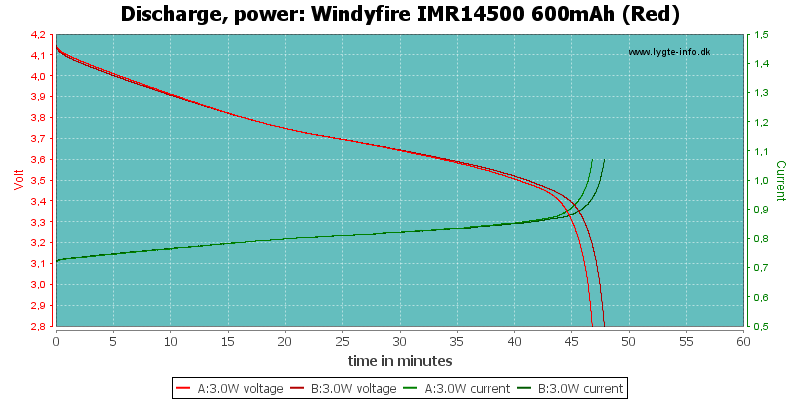 I have several of the red 14500 WindyFire’s and they are fantastic! Great for high drain applications also. 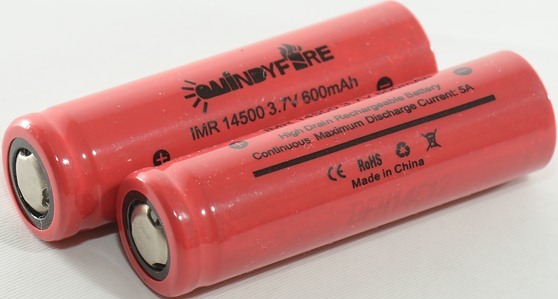 I received my 2nd order of these Red Windyfire 14500 batteries. I use them for my Thorfire TG06, Jetbeam MK-1 and Quark Pro QPA. I love these batteries for their price to performance ratio. Add to that Linda’s (of Windyfire) excellent service. Now the description talks about 650 mAh (but the picture still shows the 600 mAh version). What does it mean? Is it a new (likely worse) model? Also, it seems like they have now added another article page (the one at 11.1 USD) for small orders. I think they have raised the price a bit, but it’s still very reasonable (for 4 pcs shipped to EU it’s $15. 9 or $14.1 depending on the EU country). How do you work around that?